As a kid growing up in Southern California (we moved overseas when I was 10) we visited missions that dot the west, built by Spanish priests centuries ago. I remember the missions reverently: made of adobe and tile that cooled the warm air, surrounded by olive and eucalyptus and madrone trees. When I read this week that one of the mission’s founders is being considered for sainthood, I recalled the cool missions we visited, smelling the fragrance of the shrubs. Turns out the stories we heard as kids missed a chunk of truth. 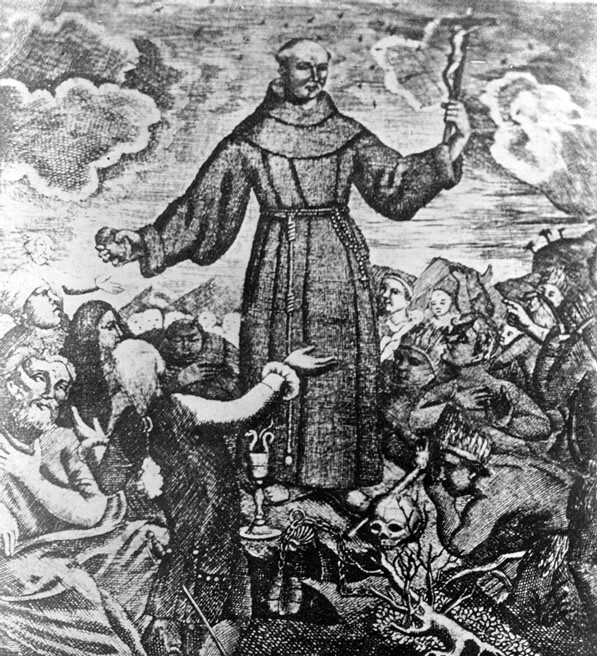 We heard that priests like Junipera Serra cared lovingly for the Native inhabitants of California and now the Pope hopes to canonize Serra. The priests are described in school textbooks as benevolent visitors who brought religion to the Indians. But pieces of the story have gone missing, according to historians who report that missionaries abused the Native peoples. On a macro-scale, settlers brought with them two things: ideological views that framed the Indians as savages, and real-life viruses and bacteria that slew more than 50,000 local Natives, according to Carol Pogash of the New York Times. And on a more microlevel, local denizens learned their religion, dress, housing, customs and ways-of-knowing were devilish, and they were forced to relinquish them. Good for journalists to acknowledge the tensions between scholars of California and Indian history with scholars of the Catholic church and missionary systems. Finally: Indians are being interviewed. Mainstream news organizations fail to dig deeply and widely into matters that impact Indian communities. Readers rarely hear the Indian voices and when we do, Natives are disparaged as regressive and foolish. As news consumers, we miss a critical piece of the story when Indian views are missed and dismissed. So it is heartening to find a narrative—like the one in today’s newspaper—where the reporter has the courage to interview folks who consider the perspectives of American Indians. This entry was posted in american indian, authenticity, framing, Indian, journalism, Junipera Serra, science, writing and tagged American Indian, California, Indigenous Science, Junipera Serra, mission, native press, native science, Pope, social justice, who is Junipera Serra?. Bookmark the permalink. Reblogged this on Cynthia-Lou Coleman's Blog.